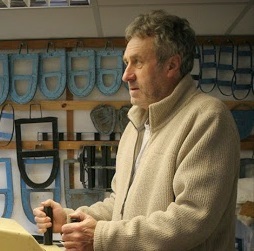 David Gibson describes how he entered the sheepskin industry unexpectedly. Back in the 1980's I resigned from my job repairing computers and printers, in the London Stock Exchange to refurbish an old building near Stansted Airport that my wife could open and use as a Nursery School. When the building work was complete, and the Montessori Nursery up and running, I felt I needed a further challenge. We had been considering purchasing a holiday property in the West Country. It had always been a dream to live in the shadow of Glastonbury Tor, and to spend some time enjoying the Somerset Levels, the history and magic of the landscape had always drawn us close to the area. I was looking initially for a project, something I could enjoy, with an eye to possibly developing a holiday business. Searching Devon and Somerset for many months proved to be a task in itself. Houses balanced on river banks, teetering on the edge of main roads, houses minus basic essentials such as a roof, or a bathroom, some due only for demolition, I had almost lost hope of ever discovering the dream that glistened in my mind’s eye. I found this old property in 1996. The Blue Lias walls, nestled quietly on a hillside, with stunning views of the Mendip Hills, the golden glow of Wells Cathedral dome, shone through the skies at dusk, and Glastonbury Tor could be seen huddling on the Hilltop, we could see it from the end of the garden. The garden, by contrast, held various artifacts including a solitary toilet, a claw footed bath and about half an acre of mixed nettles and a particularly vicious bramble mixture. The task ahead looked daunting. Together with the house, was a rather shabby, Sheepskin Slipper making workshop. Inside the less than welcoming exterior, two ladies leaned over their benches, threaded their machines and cut and stitched some beautiful sheepskin footwear. They made rugs, children’s Teddy Bears, Bootie slippers, and many other beautiful items, including a super stunning huge rocking Sheep! All made by hand, and sold out wholesale to small shops all over the country. Although my knowledge of Sheepskin crafts was extremely limited, I thought that running a craft workshop would give me something to get involved with, a new challenge on my horizon. Very rapidly I realised that the dream business was struggling, the long lists of shops to whom our goods were sent, were disappearing at an alarming rate. The demise of the high street was hitting the Sheepskin business very hard. Even some longstanding, famous, local companies, were in trouble, and Somerset although at the centre of the United Kingdom’s Sheepskin business, was losing Tanneries, and workshops at a disturbing rate. With great sadness, I considered whether I should close the business. It started slowly, orders by telephone direct from the public. People telephoning from America, and Spain, Greece and France, even Sweden and Denmark, became regular customers. We were earning more as we were now selling direct and we were not just receiving the wholesale price. Year on year we improved on the previous year, and we looked outwards for merchandise from other local companies, to add to our product list. Now we have my daughter working for us and our original lady needlewoman, is still with us, a little older, but still enjoying the sense of achievement she gets from making such stunning items. We have more staff now. Local people make up our small team. It is now, and continues to be, a learning process, and many mistakes have been made along the way. Each time we learn from what has gone before. I love what I do, and it is really wonderful to be able to watch a local craft succeed, develop, and grow into a successful business, and be aware that I have had a close hand in that success. We have sent our slippers as far away as Japan and Australia. They were sold, at Anderson and Sheppard of Savile Row (Tailor to Prince Charles). He may be right now toasting his toes in our slippers!